In December of 2013 I had to have some CAT scans done. It turned out everything was fine, but my doctor mentioned that he saw a lot of fat around my organs and that was dangerous for my long term health. So in 2014, with the help of the tips and advice from your newsletters, I lost over 60 pounds, and kept it off for over a year. But in 2015, I slacked off on doing my workouts and being mindful of what I was eating, and slowly put 30 pounds back on. I was trying to shed those pounds when the 75 day challenge was announced. Over the last 75 days, I have started eating better and feeling better, working out regularly and feeling more energetic (as anyone at the 5:30 class can tell you). 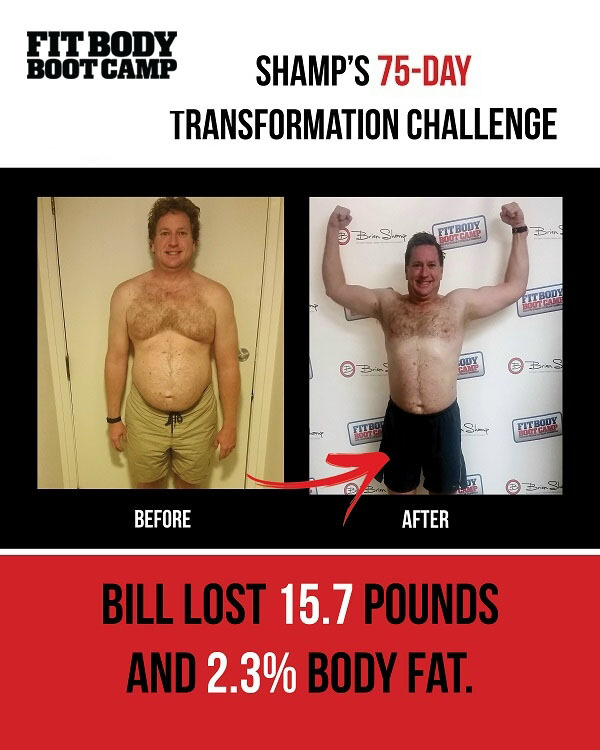 At the end of the 75 days, I have lost over 15 pounds and feel great! First, just get to boot camp or go for a run Monday through Friday, and at least once on the weekend. No excuses, just get up and do it! Enough water each day became my next goal. I had to make sure that I timed it right, but it made a difference. Even my skin looks better. Then I started looking at my diet. I was doing good on some things, like no sodas, but not on others (I really liked my dairy, gluten, tequila, and beer). But I decided to give it a try, and cut back. It was easier than I thought. I will still allow myself to “cheat” but they are not the temptations that they once were. Even the diet changes I did slowly, not rushing it all at once. It made it easier knowing I was making changes for life and not just until the end of the challenge. When you announced the Holiday Belly Buster program, I thought I would add it in, but did not get my shopping list made or to the market enough. But I pulled from it the 8/16 split and the Bulletproof Coffee. It has been added to my routine and I feel great! I know that if I keep working out and eating right, I will shed those last 15 pounds and feel healthier. I am looking forward to a great new year!